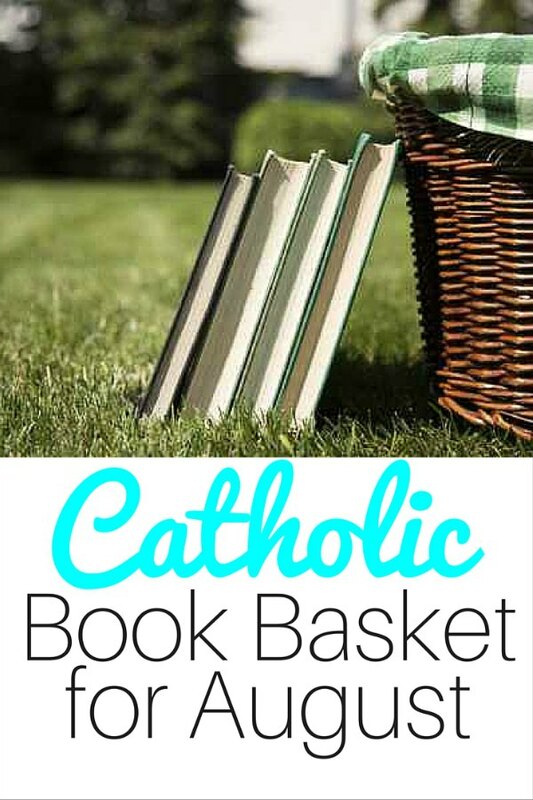 Catholic Book Basket for August - The Kennedy Adventures! Are you ready to celebrate the feast days and holy days for this month? 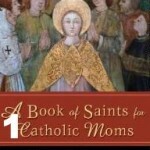 These Catholic saints books will help you learn more — take a look at our favorites. We’re celebrating the spirit of this patron saint of parish priests by taking Father Dale a treat this weekend! Did you know St Dominic was accosted by bandits! Find out more about him this month and celebrate with Rosary crafts. A Sister Marie Story: Saint Philomena, HELP! I’ve always loved the story of St Maximilian Kolbe and look forward to sharing his bravery with my children. My children love hearing stories of Marian apparitions. I’m looking forward to teaching them about Our Lady of Knock, especially since she appeared in Ireland. St Rose of Lima was the first canonized saint of the Americas! 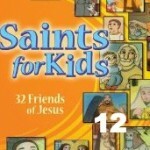 We also use these resources throughout the year for learning about saints, feast days and Holy Days, as well as our Bible stories and Catholic prayers. 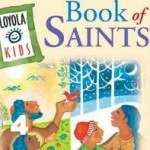 These books are a wonderful addition to your bookshelves to help you teach your children about our Catholic saints. 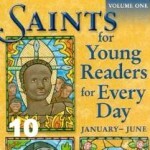 You’ll find many of this month’s saints in these selections. Add them to your wish list or ask for them for birthday or Christmas presents. This was one of the first Saints books I bought for our collection. You’ll find 106 saints here. There are sixty saints covered here, arranged in order of their feast days. 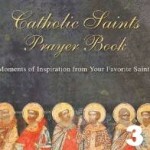 Readers enjoy a short history of the saint as well as a prayer to help emulate the saint’s virtues. From St Anne to St Zita, I love the illustrations and rhyming text of this sweet picture book. I have Rachel read this to Maeve. These two books written by Amy Welborn are some of my very favorites. It’s a pleasure to read these stories to my children at dinner or bedtime. I picked this beautiful book up at our local Catholic homeschooling conference. I’m always impressed with the beauty of books from Pauline Books and Media. The illustrations in this book are gorgeous. 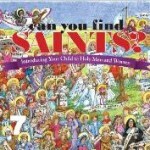 Like Where’s Waldo, only we’re looking for Catholic saints! Teaching my children their prayers is a joy for me — it warms my heart to watch them learn and hear them pray on their own. 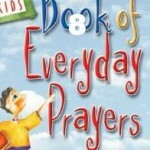 This book has a collection of traditional prayers as well as prayers for specific situations, like welcoming a new baby. 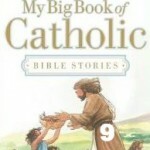 With our homeschool curriculum, we started out with the Golden Children’s Bible, but I wanted my children to hear stories in the same vernacular as they would hear at Mass. 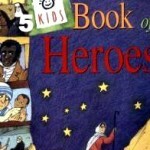 This is the Bible storybook I’d recommend to all Catholic families. 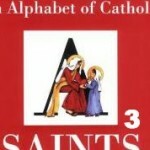 When you pick up a book of Catholic saints, you’ll find them in all kinds of different order – by Feast Day dates, alphabetical, time period and more. We use these in our Morning Time basket – the short daily readings are an easy read over breakfast. Have your kids earned screen time? Let them learn about the saints while they watch. 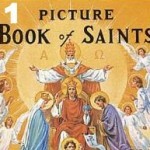 Many of the books I’ve collected for my children help me to learn about the saints as well. 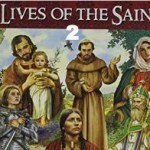 If I want something more adult oriented, these are my favorite resources for inspiration to emulate the saints and teach my children our Catholic faith. My copy of this book is tattered and dog eared, with notes in the margins. 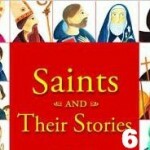 Lisa Hendey explores a saint a week, exploring their history and how we can emulate them. I read this in 3 days, then quickly passed it to one of my best friends to enjoy. This one is a must. 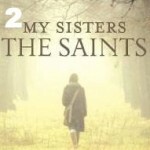 Need some guidance to ask for the intercession of the saints? 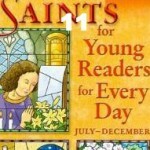 This book from Donna Marie Cooper O’Boyle can help – you’ll read a little about some of our most popular saints, along with suggested prayers. If you have a book you love to use in your home while teaching your children our faith, I’d love to hear more about it. Share your ideas in the comments!